Thoughts which don’t fit in 140 characters. I fear that this blog might paint a wrong picture of VIT in your minds. Internet facilities are the most neglected part of the otherwise quite good college. I have paid around Rs. 150 to the cafes surrounding the college, but cafes are not the best place in the world to blog. (Nor is this, with the AC above this PC numbing my hands, but I will take it.) I only want to tell the college that internet has some advantageous uses also, and its wrong to completely stop net access. Its like stopping supply of urea, a fertiliser because ew mad men make bombs out of it. Huh, moving on. I have enrolled into quite a few societies and student chapters here and have turned into a marketing agent for IEEE and Linux User Grou(LUG). The hostel is good and the teaching reasonable. I don’t understand the point of talking about exams in an engineering classroom repeatedly. But, as Ankita says, the world doesn’t run with my thoughts. I have started priliminary work on my projects. More on it later. The beauty of the campus is amazing and hard to be competed against. The library is awesome. Though, I am not a great admirer of the digital library wing. Anyways, the book collection is just ………. wow!! I found The Economist and The Harvard Business Review here also. So, the next aim is to spend an hour atleast in that wondeful place. I will try to put the campus photos in my future posts. Lets see how that materializes. Finally read my Google feeds today and feel much more complete now. Do give a look to my shared items on the right of the page. You Tube is blocked here as are USBs. So, wondering how the blog can be made more interactive. I don’t know why the spell check doesn’t work here. Will fix it any other day. So, ignore the typos. I am an adult now (ah, no not that ways!) having turned 18 this January. And being a true auto addict, my first objective was to get a Driving License. After months of persuasion, Dad agreed. Exams kept me out of Patna for a long time delaying the process. Anyhow, I got my Learner’s license last month. I was told that the original license is given only after a month. Presumably, you have to prove your skill by not banging anyone in that period. It was not a great concern, though as my driving is until now restricted to riding a bike on colony roads. Even though I am 6’ 2” with a lot of extra weight, Dad doesn’t find confidence in giving me full freedom. I came to know that my license is being made through the normal package route. Confused? It is a great service. You pay a certain amount to the middlemen, who then takes charge that your license is made, signed and delivered. Trust me, the system is rock solid. The government of Bihar has decided to do away with the old handbook type licenses and has introduced PAN type credit card sized licenses. It has also become very strict, which meant that I did finally have to go to DTO (District Transport Office) as it needed a photograph for the license. I was dealing with a a middle-aged man called Bhootnath (No resemblance to Amitabh found.) He called us at 11 in the morning on a Saturday some time back. We got delayed. Bhootnath Ji was very busy and instructed us to come later next week. Next week, we were on time and again were made to wait. Bhootnath Ji operates out of his vintage scooter parked infront of a photocopier in the same complex as the DTO. First, he made us wait for an hour and then took me along with a couple other people to the potography. I told Dad to get back to his work. The DTO is located in a 20 feet by 6 feet room, andÂ had around 200 peopleÂ when I went in. After smelling all fragrances of human sweat and all the nice words that come out of people’s mouth when they need to wait for hours to come, my number came. My photo was taken using an Intex web cam (Note to future girlfriends, don’t judgeÂ me by my face on my DL). My fingerprintÂ and signature were alsoÂ recorded electronicallyÂ and hopefully willÂ make itÂ to my DL too, not only any ubiquitous server in Bangalore. My life for the last one year was pretty much hijacked by studies and exams, forcing me to give my every wish a “consider after boards” tag. The financial situation of my family makes life a bit complicated. I took the risk of applying to US colleges like MIT, Caltech, Princeton etc. - (which are the best for engineering, if you can shed your jingoistic clothes) The risk failed and now I have to deal with its after-effects. I have not made it into IITs or any other institution of my choice. As it turned out, the words rejected, denied and sorry became the hallmark of my summer. I have qualified to VIT which is a good upcoming college, but not on the scenes if you bring along American colleges. There is a strange irritation that threatens to conquer you if you work hard for something and even then fail to get it. My parents do their best to cheer me up by buying me things that I like. But, I love them a lot and knowing all the finances, can’t make unjust demands. Now the question of buying a mobile phone. I currently have a Nokia 3120 which I share with my mother. After four years of trouble free use, it has recently started giving battery troubles and ruling itself out of my potential future mobile list. Moreover, Mummy needs a set, so we have to buy one. My initial budget was Rs. 10,000. Researched a lot, but couldn’t find any set with that “buy me” appeal. Also, I don’t like cell phone cameras, and want to get a digicam. I pulled my budget down to save money for it. The lack of options continued. The one problem with net is that it clearly shows the weaknesses of the devices, some of which one may overlook in a store. The Motorola SLVR L9 and Sony Erricson’s K550i were in the battle now. I was also looking at Motoyuva W270 which costs Rs. 3200, and save even more money for digicam. Come in the realization that the IPhone can be in my budget. IPhone is like Aston Martin. Both aren’t perfect, but have a certain character in them. (Also, I have used neither!) The IPhone 3G is expected to come out around Diwali, which made it even more difficult for me to invest in any other set. Buying something like W270 meant no camera for a long time, because the next target is a laptop. Digicam comes a distant second . After a lot of discussion with my mother, (hope, our politicians learn something from me)I decided to wait for the IPhone. The price range will be adjustable. The real worry is about the tariff that Vodafone and Airtel will come out with for IPhone. I bought a Motoyuva W270 on June 30. With the 2 GB microSD card, an Airtel connection and a lifetime recharge, the whole thing will cost Rs. 4200. The music and radio is loud and clear. Though, the build quality and everything else is a bit tacky, but then you can’t ask for a lot form the cheapest music phone on the country. Between all this, the real winner is IPhone - which has ready customers waiting for it and Motoyuva which is a good value-for-money bargain. As the BSE Sensex tumbles below the crucial 14000 mark and inflation keeps setting higher records, you may find strange to see a post on the importance of better service for growth. Growth, as of now, is nobody’s concern. Everyone is looking to counter inflation. I would also have more likely written a post on how to cut your costs using public transport than on service now. But, the actual brainstorming part of this article was done on board Delhi-Patna Sampurna Kranti Express train some 20 days back, when I was coming back after giving my Amity interview. Since then, I have been away from home in Vellore and Bombay, so the delay. I have often wondered on how new start-ups beat well established behemoth corporations in the battle for market share. Looking at a few examples, I inferred that they come with better products which connect well with customers. Also like any government, large companies generate a lot of negativity â€“ sort of anti-incumbency factor about themselves due to their poor service, which leads to their undoing. Think of General Motors and Toyota/Honda. The one thing that I often read is that India is a cost-conscious country where people are concerned more about the cost than quality. This is an unjustified opinion in my view, as I will show. When Tata Sky came on the satellite television scene, the general view was that the high-end customers in the metros will move to it. The installation costs were around Rs. 3000 and the monthly rentals were also more than that of cable networks in smaller cities. The lower middle class wonâ€™t be interested. But, the scene developed differently as two examples from my family show. My brother (who as a fresh out of college guy living in Delhi was not on the target-list of Tata Sky) decided to switch to the service after having a fight with his cable operator over poor maintenance. He told me that a lot of people prefer to pay higher cost than being subject to whims of their cable providers. But thatâ€™s not all. One of my uncles who lives in a village in North Bihar has also taken Tata Sky. There the reason is different. Cable providers used to charge a fortune during installation and any problem took days to be rectified. Tata Sky has trained a village man, who is always ready for help. And trust me, my uncle Is a cost-conscious type. But, the service advantage is too big to ignore. I have to concede that even Tata Sky has its share of service woes. It suddenly puts channels in new bouquets which increases the monthly bills and creates a lot of confusion. With Reliance ADAG coming out with its service soon, price wars are bound to occur. Letâ€™s see what happens to service then. Multiple players, price war and you know I have to talk about our cellular networks. Nothing takes away from the fact that companies like Bharti Airtel, Reliance, Vodafone (previously Hutch), BSNL etc. brought a remarkable communication revolution in India. But, as you may know, our urban markets are almost saturated with new connections and prices are amongst the lowest in the world, so what will be the next attraction for mobile buyers. Vodafone gives a hint with this beautiful ad. Sadly, our cellular providers have had a dismal service record until now. From unclear plans to special charges and unfriendly customer care representatives, consumers have often been left very frustrated. With number mobility coming soon, which will allow people to change their network without their number, service will become the most important factor. I hope our great entrepreneurs in the field of telecom take note of it and pull up their socks. They just need to give service higher priority. One of the more popular attributes associated with our middle class is how carefully it guards each and every penny of its money. But, you will be surprised to know that Indiaâ€™s leading public sector life insurer LIC has a corpus worth hundreds of crores built from the money forfeited by its customers who fail to pay their renewal on time. With the advent of private sector insurers, this part of investments is steadily growing. I will explain with an example. My favorite teacher Archana Maâ€™am got an insurance policy from Bajaj Allianz where she was supposed to pay Rs. 10, 000/- annually for 3 years as premium. She got the policy after continuous pestering by the sales agent â€“calls after callsâ€¦.. you know that. An year on, she forgot to pay the premium on time and was worried that the policy would expire and her investment will be forfeited. It would surely have if my father (who was an independent financial adviser at that time) not helped her out. You can blame Maâ€™am for forgetting to pay the premium. But, I wonder with all the computerization, couldnâ€™t Allianz send a SMS or a letter or a call to remind customers about the pending renewal! Obviously, the sales agent didnâ€™t. How could he? He might have moved to a different company and would have soon turned up with a product of his new company. And we all know that the renewal commission doesnâ€™t match those of the new policies. This is the deficit in service that I want to emphasize upon. The only company that will prosper in the long run will be the one having the best service, as most insurers provide comparable returns on investment. I was peeved to see better service being relegated as something which only the rich clients need. As urban markets mature, it will not only be the biggest differentiator, but also a tool to expand into smaller markets, as the Tata Sky in village example shows. When a person works hard on his own job, he wonâ€™t like to be troubled just because someone else considers his monthly sales target more important than the people who helped him meet an earlier one. Sales and service together only can make a business successful. As I noted down points for this post on the train, I had to stop early. Railways have provided reading lights in air-conditioned coaches. But most of them donâ€™t work. This makes the journey a lot more boring. 30,000 crores of profit has not proved sufficient for Laluji to make the 3-Volt reading light on my berth to work. I wonder what will. No Laluji, the lantern (his partyâ€™s symbol) wonâ€™t do. There is some mystical connection between television and human mind. Both can remain in each otherâ€™s company aloof of everything else. You will often find yourself watching something which you would scoff at in front of your friends. But on a very rare occasion, you might find something which you really like. A couple of days back, I was busy aimlessly changing channels, until I saw the documentary â€œAn Inconvenient Truthâ€ being broadcasted on HBO. 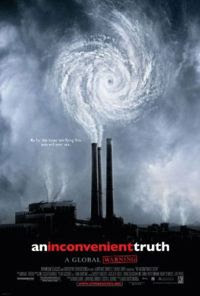 For the late starters, â€œAn Inconvenient Truthâ€ is a documentary featuring former American Vice-President Al Gore which shows the dangers of increasing carbon dioxide emissions fueling global warming and its consequences. Now, it is fruitless to say how good the movie is. It won an Oscar for the best documentary and Al Gore won the Nobel Peace along with IPCC for his work on climate crisis. One of the great problems that environmentalists face today is green fatigue. Now, people like me have been reading about global warming and ozone layer holes with beautiful multi-color diagrams since primary school. We were taught that our carbon footprint, which is basically the amount of net carbon dioxide that one puts in the environment, should be minimum. Use CFL bulbs (why not, the old incandescent ones donâ€™t help your power bill! ) Use public transport, good mileage cars etc. Most of us do, at least here in India. (Actually with crude oil going beyond $120 per barrel, we have to.) Whatâ€™s new about all this! And no matter what we do, it is not going to have any major difference, right. No. Absolutely no. This is what Al Gore presents so magnificently in the documentary. His presentation of scientific concepts is simple, effective and gets the urgency of the issue across. The graphics and pictures are top-notch. Incomplete knowledge makes the climate issues look like rocket science. (By the way, why has rocket science become a popular metaphor for all things difficult!) Ever wondered how famines and droughts occur in adjacent areas, or why so many forest fires are occurring nowadays or what is troubling the innocent polar bears. You will find such issues and a lot more neatly explained in the movie. But this is not a 3 hour science safari. It is interspersed with instances from Goreâ€™s own life. And, he is such a noble man. I canâ€™t imagine a politician talking so candidly about how his family used to have large tobacco plantations and how he now feels responsible for the spread of lung cancer â€“ something, which claimed his own elder sister. He also talks about how his life changed when his son had a close brush with death in 1988, when he lost the 2001 President elections to Bush (How could Gore have lost to Bush! ), how he battled accusations that he was trying to take away American jobs in the name of climate change, how he tried to convince people city to city, individual to individualâ€¦â€¦. It makes the movie so rich and gripping that I didnâ€™t even change channels during commercials. I just kept thinking about all that I just saw. Moreover, you will find yourself laughing with some of his insights. The most important thing is Goreâ€™s approach towards the climate crisis. He is not saying guys, this and this is happening, so we are going to see a doomsday in the near future. He unequivocally says that we have a problem on our hands, and we need to realize its magnitude and take steps to correct it. You can gauge his positive attitude in the name of his group â€“ â€œWe can solve itâ€ which works for generating awareness and seeking support towards crucial environmental issues. I am not going to rate this movie. I just feel that everyone who thinks of himself as a responsible and sensible human being should go watch it. This is better than 100 hours of lecturing on climate change. It is nice that you took out some time to read the review of this movie. Now, please watch it. Donâ€™t see yourself as a victim or witness of climate change. Consider yourself as a potent force in the mission to conserve Earth. The We Campaign is an effort launched by Al Gore and the Alliance for Climate Protection to promote solutions to the climate crisis. It’s an urgent issue, but the climate crisis is also solvable if we work together and unite our leaders around solutions like renewable power and enhanced energy efficiency. We can leave the next generation a healthy climate. After a long hiatus, I am finally posting back to the blog. The new features(on this one, I am seeing them on others since years.) are the ones I have picked up after reading the [Digit](http://www.thinkdigit.com/) Fast-track on Blogging. The break occurred as I got busy with my SATs, school exams (dozens of them, really), college applications to US, Singapore and Canada, boards and all other Indian competitions. (That's a long nice excuse, Rohit!) They are not done yet. A couple of them are still to be taken care of. In between, I have been rejected by MIT and all other international institutes except NUS - the National University of Singapore, which hasn't declared its results yet. I also recently found out that I don't have enough finances to keep my Australian plans afloat. My  AIEEE and IIT exams have also not gone as per expectations. You may say what's so different about it!! It happens to the majority. Let me explain. I am (no, was) a 'padhaku' type. Good in academics. Hopeless in sports, sort of. I wanted to go to institutes like MIT, where I can find a suitable environment to develop the business/technical ideas that I have. Also because everyone here wants to do an IIT and IIM  and then, a 6-figure salary from a big corporate house. I don't understand, why waste an engineering seat, when all you want to do is work for a hedge fund!!! But  leave apart them, I am not going to even my choice colleges in India also. I feel betrayed by my studies. All my life, I have been brilliant in academics, maintaining an image and now when it was time to reap the fruits, I found out that I wasn't much good here also.Huh!! As you might expect, all hell broke loose, and I have been in the lowest phase of my life. Constant arguments with Dad and Mom, ill-tempered and angry, I could have even given Amitabh a competition in the “angry young man” category. Thankfully, it looks like that phase has ended. Mom and Dad have found it difficult to digest how their padhaku son has developed such an aversion to studies? But, they are understanding and have been supportive. The other great help has been Ankita - my class-mate in DPS Patna, who has tolerated my idiotic philosophies and talked me out of my bad moods. She has been under great pressure herself, but she is just so solid. Thanks for being there, Ankita!! Meanwhile, I have got a good rank in VIT, and will hopefully get my choice department there. Its a good institute (Thats what I have heard and would also like to believe :) ) The counseling is on June 11. I am happy. But, there’s that little zone of confusion still. Let me put it this way. What would Alonso, the twice F1 world champion be feeling right now seeing others overtake him with the utmost of ease. Or, for those who don’t follow F1. What would Adam ‘Gilly’ Gilchrist be feeling like now? Being the best in business, and now in a situation where he and his team - the discharged Deccan Chargers are at the bottom of the league table. VIT is certainly not as bad, but when you compare it to MIT, Princeton, Stanford, IIT…….. then it is way behind. (BTW, At least comparing oneself to Alonso and Gilly gives a nice feeling.) So, I have gone back to doing things that I like the most like writing my heart out on this blog. **     **When you have to move a large heavy rock, what can you do? You can try with all your power to push the rock. But, will it work? No, not until you are a wrestler. Our infrastructure deficit is a similar problem. No matter how hard we are trying, we can only make little progress. But, a smart man won't push the rock. He will use a crowbar and use half the effort to get twice the result. We also need a similar innovative approach to handle this deficit. We must understand that infrastructure is not an isolated thing. It is the engine of the country's progress. Almost every single industry, every civic facility depends upon infrastructure for its progress. When the country is making such rapid progress, can we afford a hackneyed approach towards meeting infrastructure deficit? No. We must realize that the traffic's speed is controlled by the slowest lane, not by the fastest one. Whenever we use a product or service that is important for other important work, we value it very highly. For example, a bank carefully maintains its computers and communication mediums, without which its main business will be hampered. Similarly, infrastructure is the driver of every other sector. When we have systematic approach to maintain computers in our banks, why don’t we have a scientific approach towards infrastructure as well? I believe that we can resolve our infrastructure deficit by involving apt people and companies to do the work. I believe that there is a direct co-relation between a city’s infrastructure and its business potential. It is a two - way approach. Not only infrastructure follows progress but often it is a prerequisite for progress. A township of some factory or a private housing colony has a clear sense of order, cleanliness and well-planned buildings. When I visited Jamshedpur (Tata Steel’s factory is there) I was surprised by the amazing cleanliness, beautiful roads and the green trees all around. My cousin told me that the city’s amenities are looked after by JUSCO, a Tata enterprise. When JUSCO can maintain Jamshedpur in such a “heart-warming” way, can it not maintain other cities? I am sure it can. We must involve corporate world and trained professionals in maintaining our cities, not by token financing of public grounds, but at much higher level. Our cities are so valuable that they can be turned into successful businesses. When you go to a restaurant, it is not only the food that attracts you; the surroundings also play a major part. Similarly, cities can be projected as restaurants that provide a great atmosphere and infrastructure to come and work. In the present situation, there is a great opportunity to move the administration of cities from hazy, incompetent municipal bodies to responsible private enterprises. This solution is not only for the big megacities, but also for the smaller cities. Take the example of a medium-size city. One has to build roads, flyovers and drainage systems, look after established civic amenities and facilitate trade. All of this requires capital inflow â€“ often, the biggest impediment. Private companies can bring in the money and the expertise to carry out these projects in the most professional way. When we have management experts for a relatively miniscule workforce of a company, we surely need professionals for running a city. I am not in favor of the government taking the backseat, but it should take the side-seat like a licensing authority takes when we take road tests for issuing our driving license. We sell enough cars to support roads and get enough taxes to support cities. So, the present condition is unjustifiable. Wherever, some cities can’t sustain itself at a certain stage, the government can chip in. But the objective should be to make the city a self-sustaining unit. Also, infrastructure development has to be in agreement with environment-conservation. Unplanned growth is often more hazardous than no growth at all. There are clear roles for everyone to take in this system. We only need foresight to identify the benefits and courage to modulate public opinion. When we can trust private companies to run our stock-exchanges build our important highways, airports and make goods for armed forces, why can’t we involve them in the cities? Although, I have concentrated on cities, but the same approach holds for other units as well. I have adapted the successful BOT approach used for road-building into BORiS (Build, Operate, and Run in Sync) Sounds Nice!! Whether we have to improve schools in villages or provide medical care in far-flung areas, we only need to devise a profitable and responsible system; people will always come up and take the challenge. The infrastructure deficit that we are facing today needs to be tackled in a radical manner. The situation will become tougher every passing day. The floods in Mumbai, the dispute between shopkeepers and the High Court of Delhi etc. are incidents which showed how necessary disciplined and radical steps are for meeting our infrastructure deficit. An innovative approach can turn this deficit into an opportunity. Plsssss post a comment abt whatever u think abt this entry. One of the things that has changed a lot in India is the media â€“ both electronic and print. I can’t remember any other national policy getting so much media coverage than the Indo-US nuclear deal. But the problem with our media is that it doesn’t take a stand. Maybe it is not supposed to, it has to remain objective. But I think it needs more men like Karan Thapar and Vinod Dua who can put up the tough questions straight to our leaders and don’t accept useless replies. (Check out “Devil’s Advocate” on CNN-IBN to see Karan Thapar making our leaders realize the power of media.) This is not a post on India’s new generation media (it deserves a complete post, for sure), it is a post on the much debated Indo-US nuclear deal. I have read and seen a lot about the nuclear deal like many of you and I support it, for various reasons (even if you don’t, read the post and tell me why you do so?) â€“ I have no problem with India being a US partner until she retains her own conscience. But the daily banter on the deal irritated me. How can India not come to a consensus on such an important issue? Our politics is in general very disheartening, but seeing our leaders compromise with national interests to satisfy their personal motives was a first for me. Sometimes, a distinguished person like a former BARC president came out to oppose the deal and I became little skeptical. (I have as high a respect for BARC and ISRO as anger at DRDO- we keep ordering weapons worth billions, while DRDO takes decades to come out with an obsolete product) My doldrums were finally settled after reading Shashi Tharoor’s (India’s candidate for UN Secretary General post, extraordinary diplomat and a brilliant writer.) views in his Sunday column in “The Times of India”. US govt. has to certify that India’s foreign policy is congruent with its own. Opposition’s interpretation - we have to follow US policy on Iran, North Korea etc. What about our sovereignty (and precious minority votes)? Govt. response â€“ Hyde Act is non-binding on India. Annual review of nuclear fuel and technology supplies. Opposition’s interpretation â€“ US Prez. will switch off India’s power supply on his whims. My view: Hyde Act is like a pious, strict, non-compromising Indian constitution. As with our constitution, only the practical parts will really get implemented. You will know why? Hyde Act is the opposition area. Govt. uses the 123 Agreement (as complex as it sounds simple) is the real thing. It is the best anyone in the world has got from USA. Americans are thinking: did they give India too much? Shashi Tharoor says it really is awesome and I agree with him. A year or 2 back, this deal would have been branded as frivolous imagination. Take a bow for our PM and diplomats. No, I am not deluding. You see, this deal is relative. USA desperately needs a partner in South Asia. Pakistan was a bad experience (like funding Osama against Soviets). Left â€“ with its cold war thinking â€“ finds this another “Western imperialist policy”. The poor old guys have done only 1 thing in their lives, oppose everything tooth and nail. They underestimate India’s power -> which irritates me. Conclusion: They Need to retire. BJP and others â€“ would have launched “India Shining” Part II if they had clinched it. They have taken a shockingly callous attitude towards the deal. Don’t want to concede a point to arch-rivals Congress. Public: Most hate left, are fascinated about US partnership (I too, what is wrong about this?) Few with Leftist mindset are wearing their cold war era glasses and find strange points about the deal. Moreover, I trust our Prime Minister Dr. Manmohan Singh. He was the person to liberate India from its deep economic problems and put it on fast-track of economic development. This development only has allowed India to negotiate on such deals. We must have faith in the Doctor.